The Kwara State First Lady, Deaconess Omolewa Ahmed has denied allegations that she fails to fulfill promises made to beneficiaries of empowerment programme. Mrs. Omolewa Ahmed while reacting to the allegation on Monday through her Media Aide, Mr Yinka said the office handling the SME Loan has given first set of beneficiaries the loan. Mr. Yinka noted that the credit facility is revolving loan where first batch will need to pay up before second batch can access it. He however failed to release details of beneficiaries as earlier promised in phone conversations with our Correspondent during the weekend. Meanwhile, one of the beneficiaries, Sola Oluwaseun described the comment credited to Kwara First Lady as false and diversionary. Oluwaseun said she knows about 20 beneficiaries who are yet to get the loan. She insisted that non of the shortlisted beneficiaries at 2018 International Women Day got anything from the First Lady. 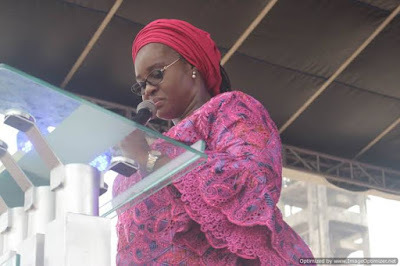 She berated Deaconess Omolewa Ahmed for non been sensitive to plight of unemployed women, adding that the event was just media jamboree to get accolade from the public.